ON TUESDAY AND Wednesday, an auction house in Durrow Co Laois will sell off €500,000-worth of items belonging to the Irish film star Maureen O’Hara. The private collection includes a fur coat and is thought to be the biggest private collection of jewellery to be sold at auction in Ireland. 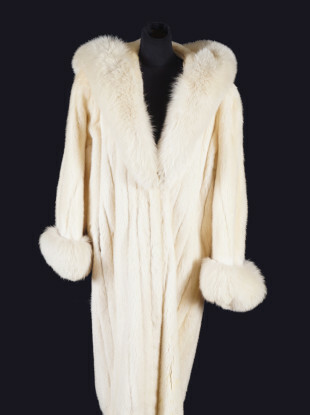 Lot 885 (pictured) is a Christian Dior full-length white mink coat is trimmed with Arctic fox fur and lined throughout with silk. The famously redheaded actress, known for her beauty and playing fiercely passionate but sensible heroines, is photographed wearing this magnificent coat in the accompanying framed image. Lot 845 is a relatively rare 18 carat white gold round brilliant cut diamond ring with baguette diamond shoulders. The centre diamond weighs 8.3 carats and it’s estimated to be worth between €100,000 – €150,000. Lot 846 is an 18 carat white gold round brilliant cut diamond solitaire ring. It has a diamond weight of 5.03 carats and is estimated to be worth between €50,000 – €70,000. and round brilliant cut diamond pendant. The emerald weight is in excess of 26 carats and the diamond weight exceeds 3.5 carats. The pendant is 42 cm in length and the emerald measures an approximate 2 x 2 cm. It’s estimated worth is between €50,000 – €70,000. round brilliant cut diamond bangle. The emerald weight is in excess of 27 carats and is approximately 1.6 x 1.4 cm wide. It’s estimated to be worth between €60,000 to €80,000. Also at auction tomorrow is a number of items belonging to the former President of Ireland Mary Robinson. Among the items at auction are a long oak table estimated to be worth €5,000 – €7,000 and a collection of pottery commissioned for the private residences of Áras an Uachtaráin. For more information see Sheppard’s Irish Auction House’s website. Email “Maureen O’Hara's fur coat and jewellery to go to auction this week”. Feedback on “Maureen O’Hara's fur coat and jewellery to go to auction this week”.